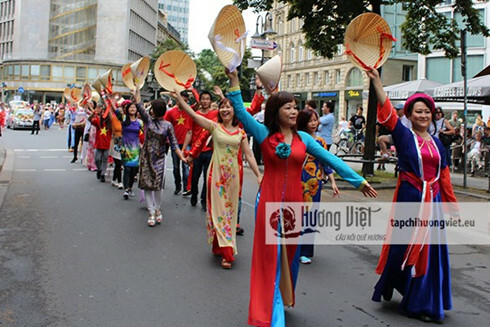 Vietnam’s traditional long dress and conical hat dance appeared as part of the “Parade der Kulturen” (cultural parade) which aimed to establish a connection between different cultures in Frankfurt, Germany on June 25. Those stellar performances, made by the Vietnamese association in Mainz and Vietnamese students association in Frankfurt, nudged a hospitable and peaceful Vietnam closer to the international friends. A large-sized map affirming Vietnam’s ownership over Truong Sa (Spratly) and Hoang Sa (Paracel) archipelagos also accompanied Vietnamese delegation during the parade. The “Parade der Kulturen” has been organised by the Frankfurter Judendring together with its 29 youth associations and other 100 organisations since 2003. Along with helping German people get a deeper understanding of other cultures, the event also creates cultural diversity in the city, making it easier for foreign residents to deeply integrate in various realms in the host nation.